"Dôjôji Matamo Kaneiri" staged in the 11th lunar month of 1840 at the Ichimuraza with Nakamura Utaemon IV and Ichimura Uzaemon XII in the roles of the two shirabyôshi. "Azuma Sodachi Yakko Musume Dôjôji" staged in the 2nd lunar month of 1867 at the Nakamuraza with Nakamura Shikan IV in the role of a kyôgenshi disguised as a shirabyôshi. 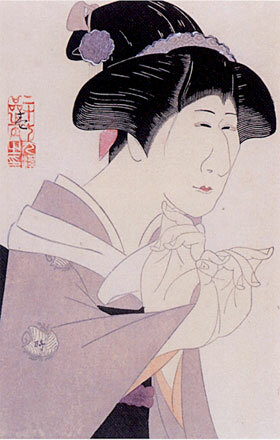 According to the legend of the Dôjôji Temple in Kishû, Princess Kiyo fell in love with the priest Anchin, who had sworn that he would spend his future with her. He unfortunately broke his promise and had to take refuge under the temple bell (tsurigane) in the precincts of the temple. Princess Kiyo pursued him across the Hidaka River in the form of a giant serpent burning with hate and jealousy. Wrapping herself around the bell, she melted it with her fiery breath, killing Anchin inside. The scene of "Meoto Dôjôji" is set at the Dôjôji Temple some time later, when a new bell has been made to replace the one destroyed by Princess Kiyo. The bell is to be hung in place that day with due ceremony, and the Dôjôji abbot, mindful of what happened to the previous bell, has forbidden that any woman be allowed with the precincts of the temple on that day. Hanako and Sakurako, two lovely shirabyôshi dancers, come to the temple and ask the priests to allow them to view the new bell. One of the dancers furtively casts vindictive glances in the direction of the bell without being noticed. The priests give them permission to view the new bell as long as they will perform a dance that is dedicated to the bell. Hanako and Sakurako agree to dance for the priests. At the height of the dance, Hanako slips off to the side. Sakurako in the process of the dance hits the brim of his eboshi hat against the rope of the bell, and the hat falls off, revealing that this dancer is in reality a man. 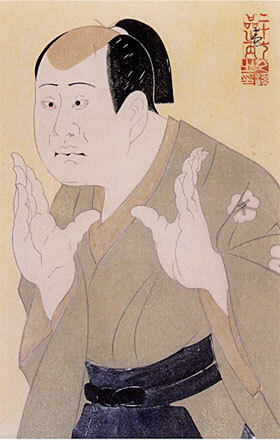 The Dôjôji priests are taken by surprise. Sakurako is in reality the kyôgenshi Sakon. The priests tell him that he must atone for his trickery by performing a Kyôgen dance for them. Sakon agrees and goes off to change into the proper costume. In the meantime the other shirabyôshi dancer Hanako returns and performs a dance, after which Sakon reappears and the two dance together. A series of other dances ensue, including a dance with flowered parasols performed by the Dôjôji priests, and Hanako's and Sakon's various dances with parasol hats and with a small drum and tambourine. While the priests are completely captivated by the dance, before they know it, the dancers have jumped inside the bell (kaneiri) and transformed into a serpent. Sakon and Hanako are in reality the avenging spirit of Princess Kiyo.